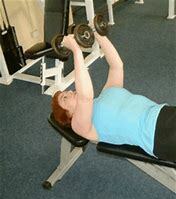 Build strong arm muscles, shoulders and abs with the Lying Tricep Press exercise. Begin lying down. Hold one weight in each hand. Lift the weight over your head, keeping your elbows directly over your shoulders. Next, keeping your upper arms straight up and down, lower the weight to the side of your head about 3-4 inches. Then keeping your upper arms still, push your arms to straight to complete one rep. Start with 10 reps. The Opposite Arm Raise exercise requires a strong and stable core. Begin with only one arm completing one motion to learn the exercise. When you’re confident in your form, add the other arm and move simultaneously. Begin without weights. Once you master form, hold a light weight in each hand. Stand with both feet together and your knees slightly bent. Bend forward from your hips, keeping your torso aligned. Bend both arms tucking your elbows into your waist. In one motion, extend your right arm forward and up, and your left arm back and up. Slowly return to your tucked-elbow position to complete one rep. Next, extend your right arm back and up, and your let arm forward and up. Begin with 10 reps total. Begin kneeling with your right knee on a chair. Place your left foot flat on the floor. Hold a weight in your left hand. Place your right hand on the chair so your back is flat. Lift your left arm so it is parallel to your torso and the floor. Bend and extend your elbow. Do 10 reps. Repeat holding the weight in your right hand. This workout is fast, effective and FUN!!!! 30 seconds WORK, 30 Seconds REST, 30 Minutes (thus the 30 x 3) and you’re done. Complete this circuit 6 times for a great, full body workout. Be sure to consult your physician before beginning this or any exercise program. Squat with Shoulder Press: Holding weights in both hands at shoulder height, lower your body into a squat. As you stand back up, raise weights straight over head in one smooth motion. As you lower back into a squat, lower weights back to shoulder height. Renegade Row Pushup: Place a pair of dumbbells on the floor and set yourself up in pushup position, grasping the handles with each hand. 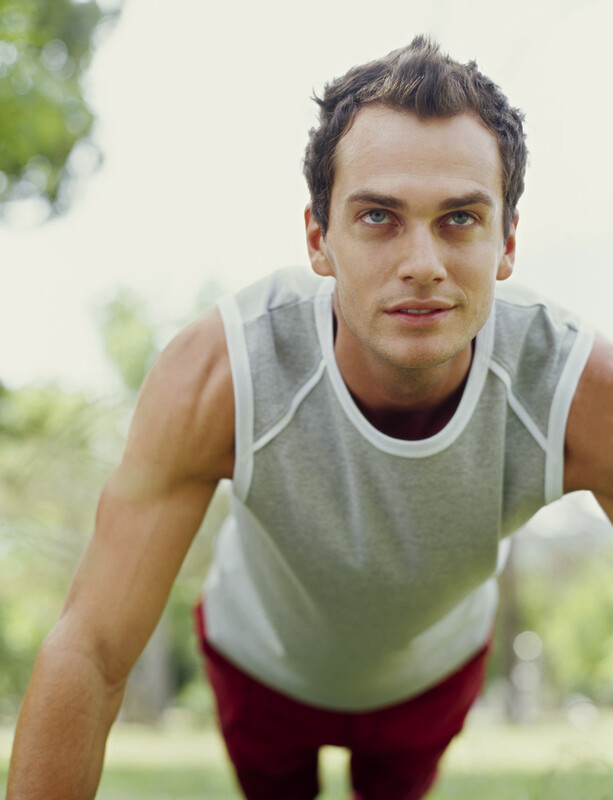 Lower your body to the floor, pause, then push yourself back up. Once you’re back in the starting position, row the dumbbell in your right hand to the side of your chest, keeping your elbow close to your ribs. Pause, then lower the dumbbell back down and repeat with your left arm. Try to keep your hips from rotating while performing this exercise. Alternating Reverse Lunge with Rotation and Bicep Curl: Hold dumbbells at your sides and stand with your feet hip-width apart. Step back with your left foot, and bend both knees to lower your body until your right knee is bent at least 90 degrees. At the same time, rotate your upper body toward your right leg and curl the dumbbells to your chest. Reverse the movement by lowering the weights and rotating your chest to face front, then return to standing. Repeat on opposite side. Tricep Extension with Hip Bridge: Lying on your back with arms extended straight above your shoulders, lift hips off of the ground. As you lower the hips back to the mat, bend arms from the elbows only and lower weights down towards the ears. (Imagine putting earmuffs on and then taking them back off.) Repeat the motion by lifting the hips back up as you raise the weights. Plank with Walkout: Set yourself up in a plank position on the elbows. Pull the navel in tight and keep the back and hips flat, step out to the side a few inches with your right foot, step out to the side a few inches with your left foot, step back in with your right foot and step back in with your left foot. Repeat. Try not to rock the hips as you perform this exercise.